About ten years ago I wrote in a submission to council on the Urban Development Strategy that the way the council handled cycling on Cranford St would be a litmus test of its commitment to active modes of transport. 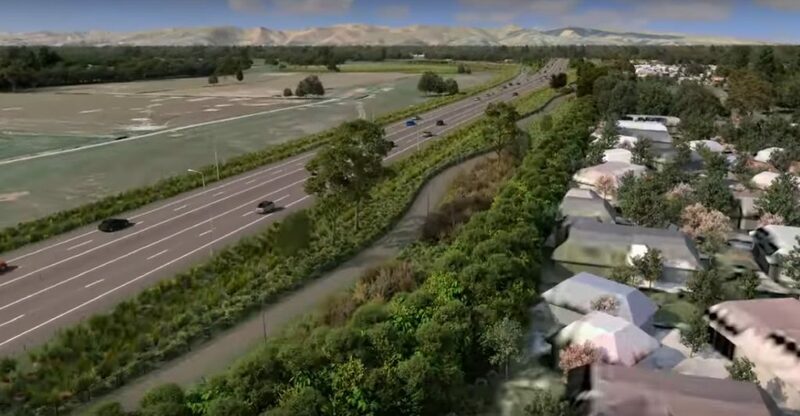 Since then the extension of the Northern Motorway known as the Christchurch Northern Corridor (CNC) has been built and it’s due to open in mid-2020. The corridor leads straight onto Cranford St. The city council is responsible for minimising the damage to downstream inner city suburbs of the expected huge increase in traffic (with public consultation currently underway). At the council meeting on 14th February this year to discuss their plans the council’s adviser said that the changes proposed for Cranford St to increase its capacity for motor vehicles would make it an unsuitable place to ride a bike and he recommended that cyclists should avoid it altogether. The plan’s recommendations run counter to the council’s policies on active transport, sustainability and many other areas, particularly creating “safe, healthy and liveable communities”. The recommendations as they stand would result in less safe, less healthy and less liveable communities. The management plan needs to come up with ideas that will substantially reduce the damage to inner city communities, not just allocate the pain across various parts of those communities, which is what it appears to do right now. This is where cycling can play an important role. The current proposal reads as a plan to accept whatever number of vehicles want to use the CNC and distribute the resulting downstream pain as sensibly as possible. There is no way to do this without causing serious damage to St Albans and the surrounding suburbs. Far more effort needs to be placed on minimizing the number of vehicles arriving on Cranford St by adopting serious Transport Demand Management actions. The plan’s proposal for TDM is to look into a High Occupancy Vehicle (HOV) lane. The evidence that HOV lanes reduce vehicle numbers or congestion is flimsy and contested by academic reports (e.g. Effectiveness of California’s High Occupancy Vehicle (HOV) System, Jaimyoung Kwon and Pravin Varaiya). A HOV lane could actually increase travel times and have very limited impact on vehicle numbers. Damage to inner city suburbs is unlikely to be reduced. Suburban rail transport of any kind in Christchurch has been ruled out on several occasions and the chances of any progress before the opening of the CNC are very low. This leaves only two options for managing traffic demand, namely buses and cycling. Improved bus services to points north of Christchurch would no doubt help if done well and this has been proposed elsewhere(Video presentation by Axel Wilke – Alternative Plan of Downstream Effects of Northern Arterial Extension). Cycling could play a crucial role in reducing the downstream congestion and all of its related negative consequences so long as the new cycleway being built alongside the CNC is treated as a critical part of the city’s transport network and not simply designed for recreational rides on the weekend. Imports of e-bikes have increased approximately tenfold in the past three years with around 17,000 being imported in 2018. Overseas studies have found that the distance people are prepared to commute on an e-bike has extended cycle commuting from around 5 km with a standard bike to about 15 km on an e-bike. Some countries are encouraging the switch from car to e-bike for longer commutes. (E-bike to get commuters out of car). The thousands of residents in the suburbs of Belfast, Northwood, Casebrook, Redwood and Northcote are all well within range of the city centre and they could take advantage of the new cycleway given proper access. While Belfast is within e-bike commuting range of the city centre there would be few in Rangiora, Kaiapoi or points north who would choose to commute to the city centre by bike. Another alternative is needed. In the past multi-modal commuting has concentrated on combining driving and public transport. There has been rapid uptake in the past four years of Park and Pedal where part of the trip is by car and the rest by bike. There is a large scheme in Boston, MA which has been running for several years and has been expanded several times. 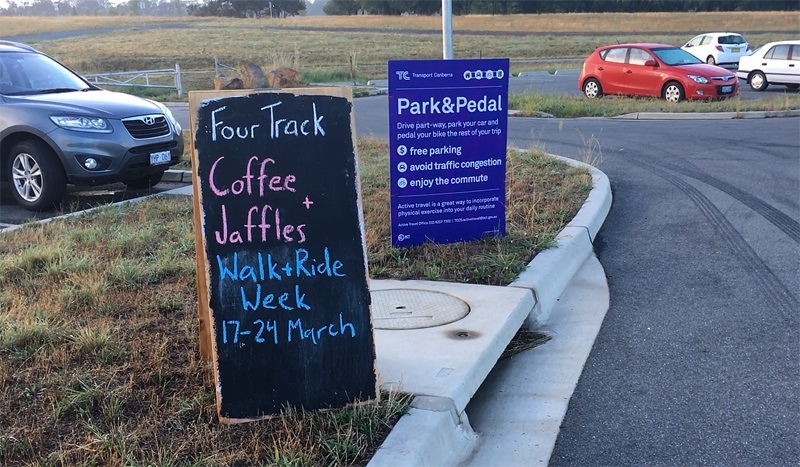 Park and Pedal has also started recently in Canberra, ACT. There are also several schemes in the UK including Oxford, Canterbury, York and Salford. Park and Pedal is a viable and growing option being implemented in cities around the world and no city is more suited to making it succeed than Christchurch. The various schemes differ in many respects including whether they are free or paid and whether there are bike storage facilities. Christchurch has a big advantage in that a high proportion of cars have bike racks and those that don’t can have them added at a reasonable cost. Long distance commuters can drive up to the Park and Pedal car park, offload their bike in a matter of minutes and be on their way. There is no need for bike storage facilities or anything else other than room to park a car. Implementing a Park and Pedal scheme is therefore a low cost option. The precise location(s) of Park and Pedal car parks would need careful study but an obvious possibility is to the North East of the CNC/QEII Drive junction. Access and egress could be via the slip road from the CNC to QEII Drive Eastbound. This would allow commuters to easily get back on the CNC via the junction roundabouts to head back North. 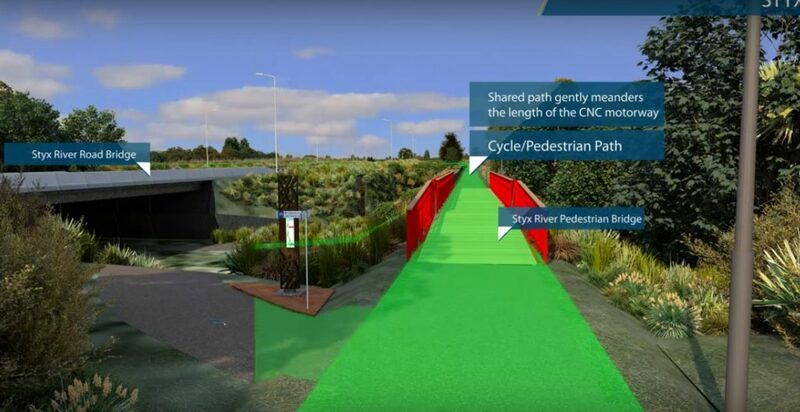 A bike tunnel or bridge across QEII Drive would be needed to connect with the cycleway on the south side which then gives access to the Papanui Parallel and other cycling routes via the planned tunnel under the CNC. Use of a Park and Pedal option conforms with council policy to “Develop a culture of innovation around the future of transport and new/emerging technologies which allows for pilot and demonstration projects.” It has the potential for use elsewhere in Christchurch to relieve serious traffic congestion, particularly on the Southern Motorway/Brougham St. The most recent report recommends a high quality north-south cycleway east of Cranford St. The proposed Park and Pedal site would be perfectly placed to link with such a route which would give rapid access to the city centre. This cycleway should be progressed urgently and not left to a later phase of development. The east-west cycle links to the Papanui Parallel should also be completed early to allow quick access to a range of destinations. Easy and abundant access to the cycleway for suburban residents. The map and flyover provided by NZTA both appear to show very limited access to the new cycleway with only three access points along its entire length, Belfast Rd., Radcliffe Rd. and Prestons Rd. As noted here previously, it seems that the cycleway is being treated as if it was a motorway with limited access points. There should be far more access points all the way along the cycleway so that residents in the outer suburbs have direct routes from their homes onto the cycleway. There are very few cycle lanes or cycleways in the outer suburbs near the new cycleway. Residents need safe access to encourage them to use it, especially across Main North Rd. The improvements related to the new cycleway appear to go only a few metres off the main route and then disappear. This needs to be reviewed and improved. The cycleway is shared with pedestrians. From the information supplied by NZTA there appears to be no physical separation of cyclists from pedestrians nor any lane markings. The detailed design of the cycleway should be looked at by experts in the field to make sure that it is designed to standards that ensure the safety of all users bearing in mind that some of those users will be riding e-bikes. Where the CNC crosses QEII Drive motorists have a direct route over the top while cyclists have to make a lengthy detour. Consideration should be given to providing a bridge for cyclists to shorten the route. The crossing of Winters Rd on the fly-thru video also looks dangerous with no facilities for cyclists and, if this is still the case, it needs to be improved. Involving more cycling expertise in building the best possible solution. 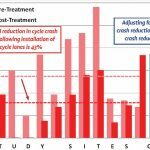 Cycling has been given very little consideration in the latest downstream effects report and this may be due to more cycling expertise being needed on this project. The Electric City research programme at Auckland University has produced a very useful report on e-bikes and the future of cycling in New Zealand and their staff obviously have a lot of expertise in this area. Either they or their colleagues at the University of Canterbury should be used to provide advice. Nice cycleway but how do I get onto it? Timing of completion is critical and cycling infrastructure should be completed and open for use before the CNC. The 30 km/h zones should come before the opening of the CNC to improve safety for cyclists and pedestrians in the downstream area. Consider including Cranford St between Innes Rd and Berwick St in the 30 km/h restriction. This would allow safer cycling on Cranford St and safer crossings for schoolchildren. Provide ample parking and recharging facilities in the city centre for both standard bikes and e-bikes. Work with employers to encourage employees to travel to work by bike. Provide lease of e-bikes short term to those considering their use. Promote the cycling option in every way possible. Provide good lighting on the cycleway. The Southern Motorway feeds into Brougham St, which is two lanes each way but still gets seriously congested at peak times. The Northern Motorway will feed into Cranford St, which is one lane each way. Without Transport Demand Management of the kind suggested here the congestion will be far worse than on Brougham St and the consequences for residents serious. A Park and Pedal scheme would be popular with commuters for many reasons. It provides a door to door trip with no delays at the switch from car to bike, it saves on parking fees, provides healthy exercise and given likely traffic congestion is probably just as fast as driving all the way. Proposals in the latest plan conflict with other council policy in a wide range of areas and cause damage to the downstream suburbs and their residents. The suggestions raised here would go some way towards reducing that damage. I have put in a submission based on the ideas in this article. If you would like to make your own submission you can make it here. Closing date is Mon 15th April. Would these ideas help to mitigate the downstream effects of the Northern Arterial? Wow thanks so much for sharing this. I am extremely impressed with the clarity and thought that you have put into this. Park-and-Pedal is a remote carpark where you leave your car and get on your bike for the last part. Other workable ones are Pedal-Park-and-Bus, for those who want to ride to a bus stop for the last part. This is surprisingly common in Rolleston, where the last major bus stop has anything up to a dozen bikes locked to the local fences for the day. A covered bikeshed shelter makes this so much nicer, and the parked items take way less space.